This evaluation is strictly based on my visual observations as I currently have no means to test them on a layout. However I do have plenty of real-world experience with MT and Kato couplers. I also had some experience with Accumates. I am a member of Northeast N-Trak (where we run long trains on relatively rough trackage) and I also belong to couple of round-robin groups operating local layouts. For now I decided to visually compare several coupler brands I have in my collection. 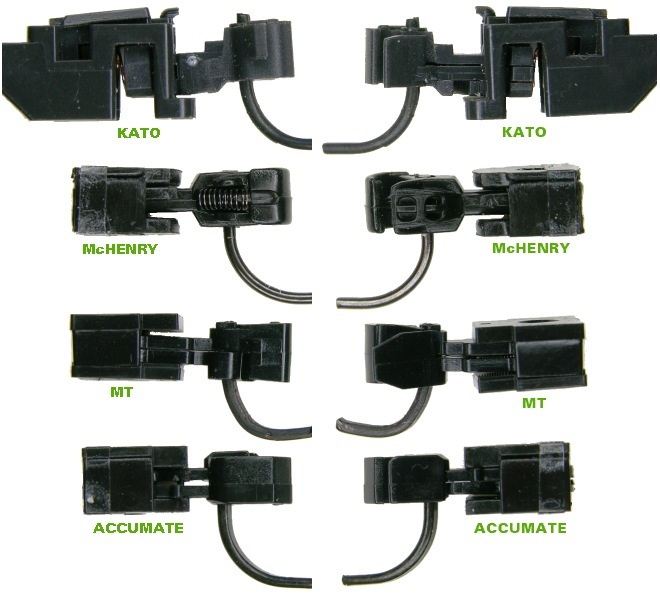 I’ll be comparing Kato, MT, Accumate and McHenry couplers. This should give a good visual indication of the differences between those couplers. My coupler photos are in-scale to each other (within each photo). I wish that I also had a sample of MT Z-scale couplers at my disposal when I was doing this comparison (as many people seem to use them in N scale as close-to-scale couplers) but I didn’t have any. These photos were taken on a stage with camera at the same fixed distance to each coupler being photographed and using the same settings for each photo. Then the photos were cropped and merged without any resizing. First photo is a top view of these couplers. This is the view from which most people see their couplers and make a judgment of a coupler size and how similar they look to the prototype AAR couplers. I also included drawing of a real coupler but I really had no size reference (I have not found any web references which would give me some real dimensions of the AAR coupler). If I had those dimensions I could have made sure that I showed it in true N scale proportion to the other couplers. As it is shown now its size might be somewhat incorrect. But I put it there to compare the general shape of the couplers. Next is an overlay showing outlines of all the couplers. After many experiments trying to align them I decided to line them up by the base of their shanks. This shows that their sizes aren’t as varied as they appear. But still the McHenry coupler is the bulkiest one and that makes it look quite “portly”. Next are profile views from both sides. Accumate seems a bit lower profile than the rest. McHenry has excellent detail on one side and a hideous spring on the other side! I never modeled in H0 so I’m not used H0 Kadee couplers with a similar spring so McHenry’s spring looks to me totally out of place and unrealistic. Since the spring is fully exposed I also wonder how often it’ll dislodge and get lost. On the bright side, it is a steel spring so a track cleaning car with a magnet will be able to pick up all the lost springs. Next series of images shows the draft gear boxes and coupler parts. These show quality of molding. These images show that MT couplers have very crisply molded and flash-free parts. That is especially evident in the MT’s draft gear box. Kato coupler parts are just as crisp as MT. Next in molding quality would be Accumate. Their molded edges are bit softer and surfaces are a bit rougher than MT or Kato. McHenry’s draft gear box has lots of soft details and rounded edges. MT molded a nifty draft gear box cover latch into the screw sleeve. It works quite well. McHenry attempted a similar latch but the molding has soft edges and it doesn’t latch the draft gear cover at all. I’m surprised that in this day of modelers looking for couplers which are close to true scale size McHenry would manufacture such oversized looking couplers. Many people use MT Z-scale couplers to have a more close-to-scale coupler yet McHenry coupler is the largest N-Scale knuckle-coupler yet! I suspect that N scale McHenry couplers might be close to true scale size coupler for H0 scale. Maybe they are planning on also marketing this coupler to the H0 crowd? Last item I would like to bring up is the centering springs. This is a bit difficult to evaluate without an uncoupling magnet but I can feel the spring tension with my finger so I can make an observation. I also have plenty of past uncoupling experience with all the couplers I covered except for McHenry. Some people don’t really care about magnetic uncoupling because they manually uncouple their cars using some sort of mechanical uncoupling tool (like a wooden skewer). But some layouts I operate have industrial spurs out of reach and magnetic uncoupling is vital to enjoyable operation. Nothing is more frustrating than time wasted on unsuccessfully trying to magnetically uncouple a car while the fast clock is running! In my experience MT couplers are the best ones to use when using magnetic uncoupling. That is especially true when they are lubricated with powdered graphite. I suspect that this is due to their well molded parts and the very soft copper-alloy springs. Kato couplers have a similar spring but it’s a lot stiffer. It is pretty much impossible to perform automatic magnetic uncoupling using Kato couplers. I seem to recall that even Kato states that they are not really capable of magnetic uncoupling. Accumate uses plastic leaf centering springs molded to the coupler shank. In my experience those are much stiffer than the MT springs and thus they do not reliably uncouple over a magnet. McHenry also uses plastic leaf springs molded to the coupler shank but those are only used for centering the shank. For unlocking the knuckle they use a method very similar to the one used in Kadee H0 couplers. Unlike other N scale knuckle couplers where the coupler is split horizontally for a scissor-like opening action, McHenry pivots the knuckle itself. It is pivoted on the uncoupling pin and held closed by a small steel spring. That spring seems a bit stiff to me for an uncoupling magnet to reliably open it. That in combination with the stiffer plastic shank-centering spring doesn’t seem to me like it will uncouple reliably over a magnet. That about covers everything. My evaluation shows to me that Kato couplers seem to be closest in shape and size to the 1:1 AAR couplers. McHenry’s shape is somewhat reminiscent of the 1:1 coupler but it is too chunky and its body is way too long. MT coupler is oversize but not as much as McHenry, however its overall shape is not very similar to 1:1 coupler. Accumate to me looks most toy-like. Its shape is just plain strange. Lots of flat surfaces joined at odd angles. If someone hasn’t noticed by now, I have a strong bias towards Micro-Trains couplers. I think that I have valid reasons for this. MT couplers have the best quality molding (especially their couplers with reverse draft angle) and in my experience they seem most reliable. I think their reliability is due to that clean molding, close tolerances and the soft springs they use. They also have the largest assortment of coupler conversions of all the knuckle-coupler manufacturers. This makes it easy for me to find MT coupler to fit pretty much any N scale model. Because of all those facts I am willing to overlook the fact that it does not look like a 1:1 AAR coupler. This evaluation only further solidifies my opinion – MT couplers are the best out of all the currently available N scale knuckle-couplers.